We piled into a tiny European-style van shoulder to shoulder, our day packs on our laps, and hardly a breeze to bring fresh air. Then we departed on our drive to the trailhead. The road twisted and turned as we travelled from sea level to the top of the Tramuntana Mountains. Sitting in the back of the van with no air as it whipped around hairpin turns I became profoundly car sick and had to go to my happy place. Eventually we arrived and I could stretch my legs and get a good look at our fellow hikers. Our group was diverse, hailing from Spain, Germany, the UK and the US. Our guide ran through introductions and asked about everyone's hiking experience. The tour company we signed-on with was Tramuntana Tours. For 44€ a head (now 55€) we were provided transportation from their office to Escorca, where the Hike actually began. The fee also included a ferry ride from the terminus of the hike to Port de Soller where our car was parked. As our tiny bus/van pulled away, our group of eight set off towards the canyon. We were immediately granted a series of stunning views of the surrounding peaks as we wound our way down to the canyon floor. The morning mist combined with the rising sun to create a beautiful scene as we switchbacked down to the valley floor. Half way down a narrow path of zig-zagging switchbacks we were finally able to see the mouth of the canyon: A dark slice hundreds of feet high cut right out of the limestone mountains. 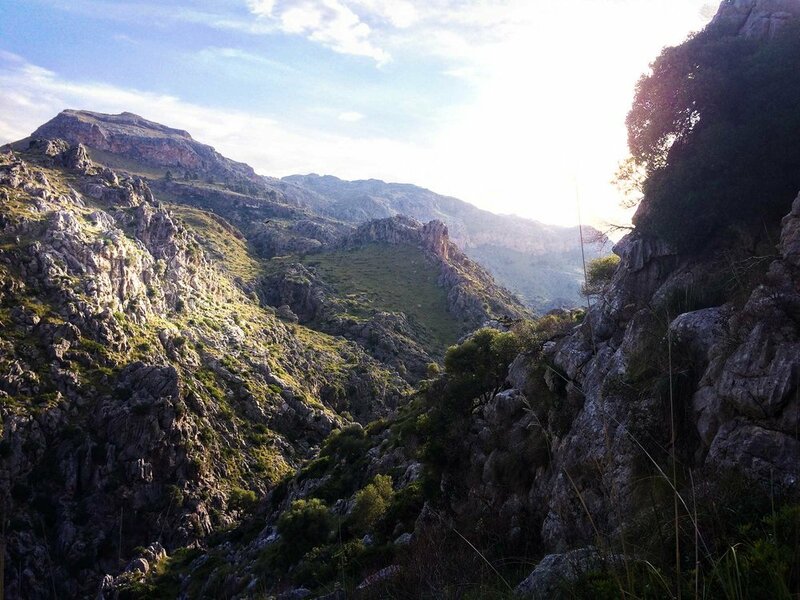 Torrent de Pareis, which means “Twin Rivers” officially begins where Torrent de Gorg Blau and Torrent de Lluc meet. (I think). The hike to the canyon floor took approximately 45 minutes. From the canyon floor we were treated to 360° views of rock walls. Usually we're climbing peaks, but this was quite the opposite, and it was a strange sensation. 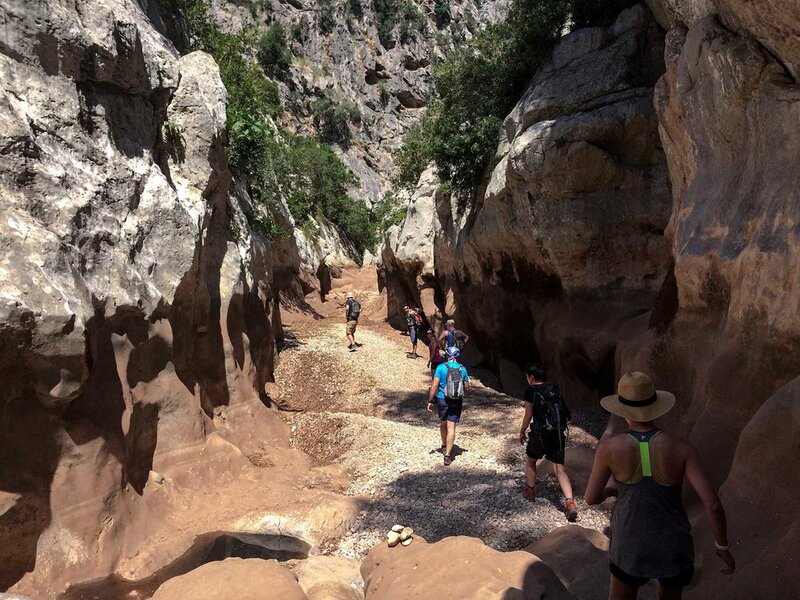 At this junction in the canyon there is access to Torrent de Gorg Blau, a section of canyon so deep and steep that no light makes it to the canyon floor. We only ventured slightly past its opening, but even then it was a haunting place, dark and cold. Someday if I return I would love to explore this arm of the canyon. The canyon of Torrent de Gorg Blau was otherworldly. If you like this sort of stuff, check out the other photos in the full gallery. Our guide, Dante was outstanding. His guidance and calm in tough sections kept the mood of the group jovial. We met a couple from a small town on the mainland called Girona, that just so happened to be on our itinerary later in the trip. They were amazed were had even heard of their town, and offered to meet up with us when we arrive there. Shortly after reaching the canyon floor, we encountered sections that required some light scrambling. We continued deeper into the main canyon and the terrain quickly became more challenging. Small rocks turned to larger ones and eventually became scrambles. The scrambles became trickier. Some sections were covered in water and we had to remove our boots to negotiate the passage. Eventually the route required ropes to be used as hand holds for additional stability (no anchors or harnesses). I had a feeling that I could have gotten by without but it would have been extremely frightening. This was the point where I was grateful we signed with a tour company. I spent a lot of time pondering the nature of flash floods during this section. Eventually we reached the end of the canyon where the walls flared out and the river emptied into the sea. There were several boats moored in the bay and the water was a gorgeous shade of blue. It looked like the sweetest paradise after suffering in the heat, and yet it was unreachable. To complete the hike we had to walk down a long tunnel carved through the mountains separating the canyon from the sea. I was about ready to drop dead, but at least the tunnel was cold and dark. After a few minutes of tunneling, the cavern opened up to the village of Cala Colabra, the end point of the hike. Here we were able to wade in the cool water of the Mediterranean and sit in the shade. We ended up having a beer with Dante and out new friends from Girona. It was a great way to unwind and relax before the ferry showed up to take us back to Port De Soller. The ferry back allowed spectacular views of the limestone cliffs and mountains from a new perspective. Frustratingly, the ferry putted along at an abysmally slow pace and seemed it would never reach it's destination. After forty-five minutes we finally pulled into Port de Soller. I was exhausted and overheated, but felt a nice sense of accomplishment. The hike route shown is a one-way hike from the top of the mountains in Escorca to Port Calobra. 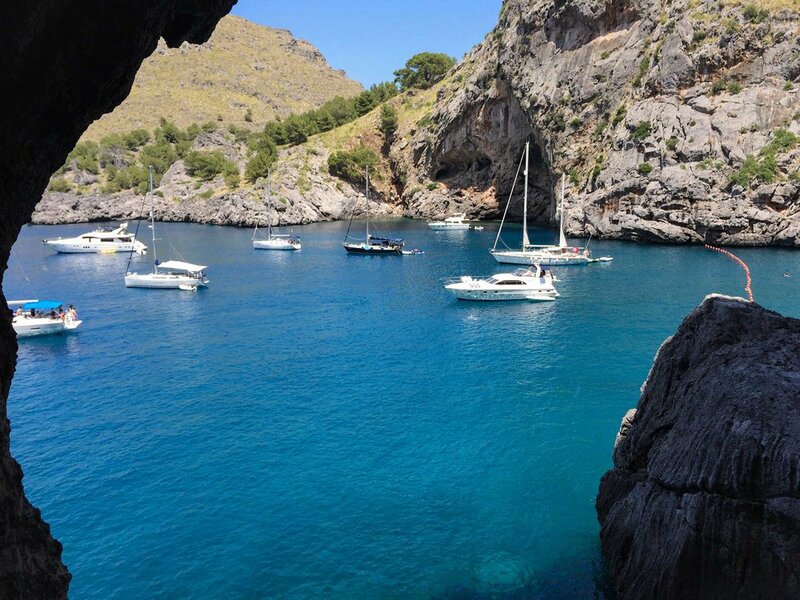 From Port Calobra, one can purchase tickets for the ferry back to Port de Soller. The hike itself is approximately only 4.16 miles, but in the heat they are some tough miles. 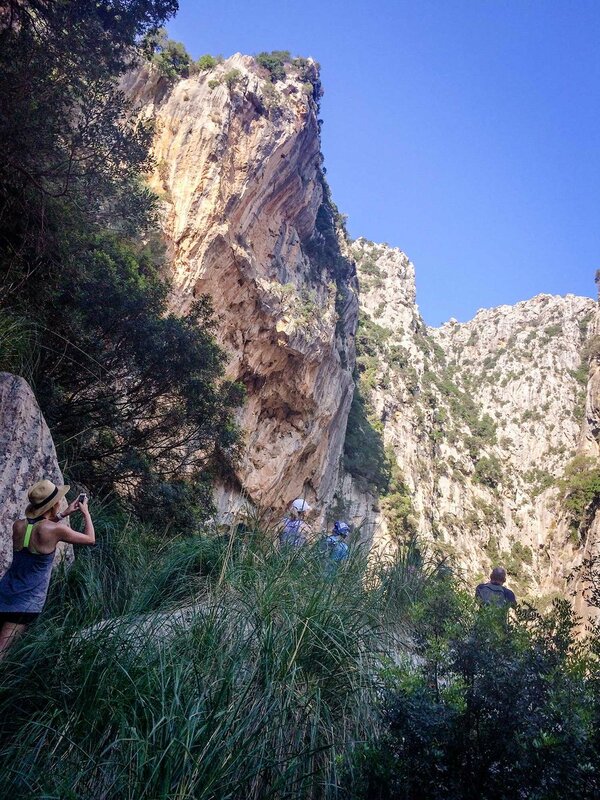 The Torrent de Pareis isn't technical, and can be hiked in crappy sneakers, as my Mom proved. However, I do recommend you plan to bring the following gear, as I find being properly equipped helps one enjoy the activity more. Water. Bring more than you think you need. It is hot, and if you have a slow poke in the group you'll go through more. At least two liters per person is needed. Maybe more if you have the diabetic thirst as I do. Proper footwear. It doesn't have to be boots. Trail shoes would be fine too. I would opt for something with Vibram soles. You don't need to grab for the Gore-tex lined boots either. The canyon is pretty dry, and the pools we had to wade through we removed our shoes for. So you could let your feet breath a bit by using shoes without a waterproof lining. Sun protection. Sunscreen, hats, and buffs or bandanas to help keep the sun off your face and neck. I'm not kidding. The sun was brutal in June. Tasty food. We made sandwiches, but they were on hard bread, with tough cured meats. In the hot temps, they were a chore to eat. Pack something that you're going to be able to easily eat even when exhausted. Eat protein heavy foods the night before, and choose something high in carbohydrates for during the trek. Keep your sugar levels up so you don't run out of gas at the end like I did. A good camera. I made do with my iPhone, but wish that I had the capabilities of my DSLR for many of the shots. Go with a guide. While the terrain would have probably been manageable for a skilled hiker, without a map or experience in those parts, there were several areas I would have sworn weren't the 'correct' way. We could have easily spent significant time determining the right path down, since the trail is so inaccessible and you'll likely be on a holiday, do yourself a favor and take that stress off your mind. Mallorca is a beautiful island, with amazing people and food. The landscape is fantastic, and if you are drawn to the hills and mountains as I am, I think you'd find it a nice blend of beach laziness with some great, intense outdoor activities. If you do give the Torrent de Pareis a go, drop me a line. I'd love to hear how your trip went, and how this article helped (or fell short of helping) prepare for your trip.